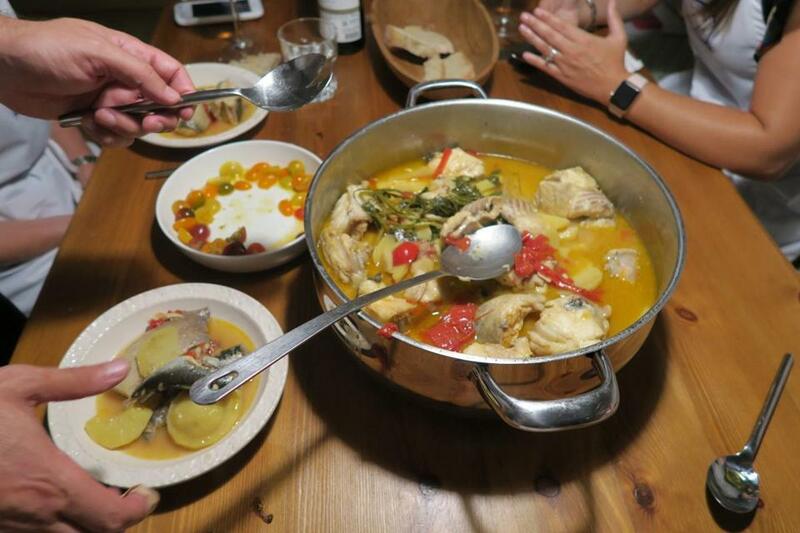 Caldeirada, a traditional fish stew, is served. On an unseasonably warm fall evening in Lisbon, our driver dropped my two travel buddies and me off at an unobtrusive building in Alvalade, a leafy residential neighborhood far from the usual tourist destinations. Once buzzed into the lobby, we squeezed into the elevator and ascended to a bright apartment where we were welcomed with hugs and mini bottles of Sagres beer. In the open kitchen — with shelves of cookbooks and a window offering rooftop views — we snacked on a trio of unpasteurized cheeses, from a sweet and creamy Azorean cows cheese to sharp and nutty sheep milk varieties from nearby villages. We chatted about olive oil and chorizo, politics and crazy weather patterns, our work and our families — the usual banter of friends who gather to cook and dine together. Except in this instance, it was the first time meeting our host. In a twist on the trend to go shopping with a restaurant or hotel chef followed by a cooking class in a commercial kitchen, my friends and I were connected with a local chef for a class and meal in his home. This was arranged though Cox & Kings, a tour company that pairs travelers with experiences that interest them. For us, that meant culinary-themed expeditions. In my case, it was an extra treat (and surprise) because the chef turned out to be Ricardo Dias Felner, a former political journalist who got hooked on the food world, became a restaurant critic, and was editor in chief of Time Out Lisboa and Time Out Porto magazines. 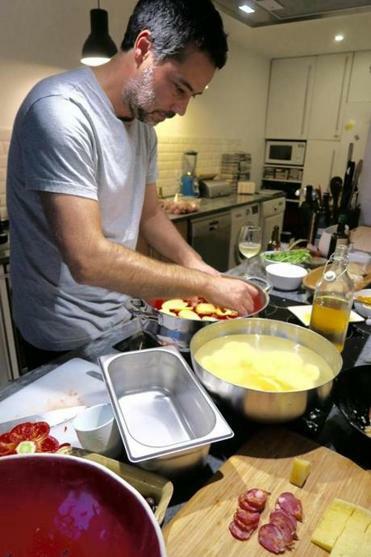 In Lisbon, Ricardo Dias Felner leads food tours and teaches cooking classes of traditional Portuguese dishes in his home. On our menu was a first course of clams Bulhao Pato style, named after a 19th-century poet who is said to have loved the dish. But first we were tasked with prepping items for our main course, Caldeirada, a traditional fish stew. Felner had shopped at the local market in Avalade — his favorite in all of Lisbon — and showed us a bowl of glistening salted fish ready for the pot. The fish had not been fileted, he explained, because the skins and bones add flavor. There were plump sardines (minus heads and tails), and chunks of conger eel, monkfish and skate. The surprising thing about the stew was not the ingredients, but the preparation. “We do it in layers,” said Felner. And so we layered all the raw elements in a deep, wide stovetop pan, in this specific order: olive oil, rounds of sliced onions, crushed piri piri chilies, rounds of sliced tomatoes, spears of red bell peppers, salt, chopped garlic, peeled and sliced potatoes, sprigs of parsley, bay leaves, salt and pepper. Once the liquids heated up, the flame was lowered, and a glass lid sealed the simmering broth. Nothing was stirred or mixed, although Felner shook the pan slightly, loosening the onions to keep them from sticking. It reminded me of layering lasagna — with uncooked ingredients — and hoping for a magical melding of tastes and textures. Would it work? I was curious to find out. While the stew cooked, we turned our attention to the ameijoa boa, baby clams. 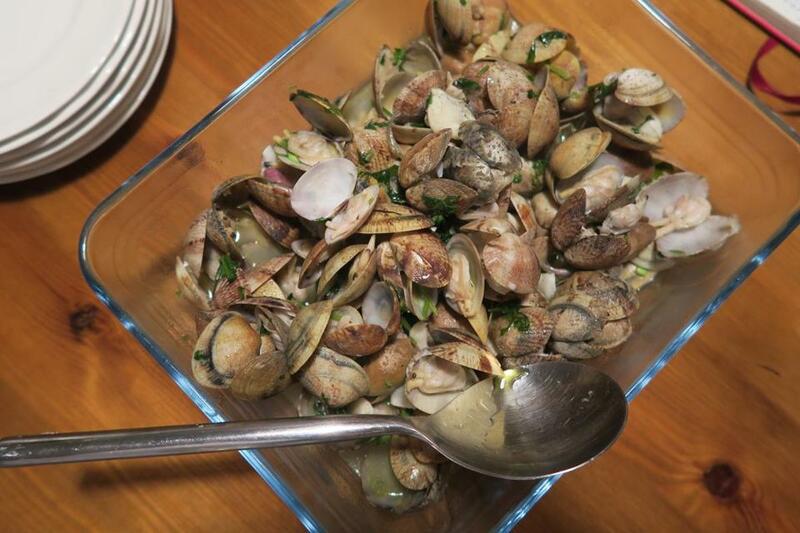 “These clams are all about the garlic and coriander,” said Felner, noting that Portugal is the only Mediterranean country to use cilantro in traditional dishes. A first course of garlicky clams. We quickly sautéed the clams in olive oil with smashed organic cloves and a generous handful of cilantro. They opened in minutes, and were scooped into a glass serving bowl. We sat at a long wood table in the kitchen, eating the salty-sweet-garlicky bivalves while the stew simmered, and the wine and conversation flowed. A little over an hour later, Felner declared the stew was ready. Felner filled our bowls with steaming golden broth and succulent morsels of fish laced with bites of sweet bell peppers and mellow potato rounds. Somehow, the magic melding had worked. The stew was an ambrosial meal, a simple peasant dish worthy of kings. And dessert? Felner had purchased Lisbon’s iconic egg tarts, pastel de nata, from his favorite bakery. The creamy custards had notes of cinnamon, and were the perfect accompaniment to the 50-year-old port wine poured from an enormous basket-wrapped bottle. As the evening wound down, Felner’s wife and children returned, and we met the entire family. After hugs and bedtime kisses to the kids, it was time to head back to our hotel at the Four Seasons. Of all our subsequent travels, this was the highlight of my trip because — for one night — I didn’t feel like a tourist. I was part of the community. Though we started out as strangers, if I ever return to Lisbon, I now have a friend.